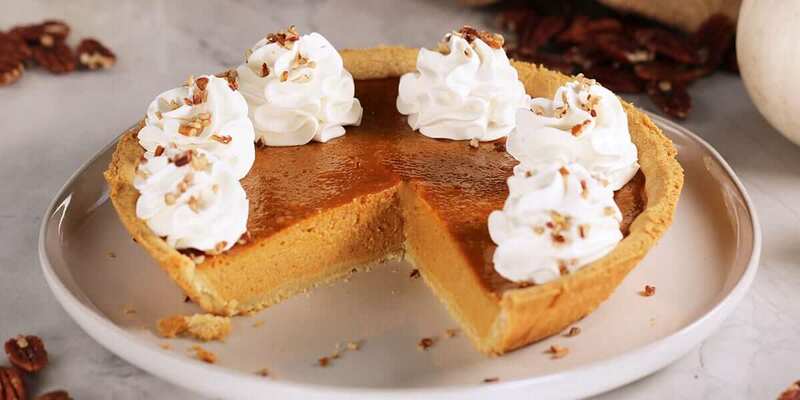 This low-carb version of classic pumpkin pie is virtually indistinguishable from a traditional pumpkin pie; a buttery, flaky crust filled with a luscious, spiced, pumpkin custard filling. Elevate this silky pie with whipped cream and chopped pecans––no need for any additional desserts! Make the crust: place the almond flour, arrowroot, and salt in the bowl of a food processor and process until combined. Add the cold, cubed butter, and pulse until the mixture resembles pea-size crumbs. Add the egg white and water mixture and continue to pulse until you have a smooth batter. Transfer the pastry circle from the freezer to the counter, and use a rolling pin to smooth out the dough. Remove the top layer of parchment and flip the dough into the pie dish. Carefully peel off the second layer of parchment and press the dough into the dish. Trim the edges so the crust is even with the top of your dish. The pastry dough will soften quickly after it is removed from the freezer, so work fast for best results without cracks or tears. If the pastry has cracks, simply fill them in with excess dough. Make the filling: simply place all ingredients in a mixing bowl and whisk until well combined, then pour into the dough and place in the oven to bake for 50 minutes, until set. Gently shake the pie dish to see if the filling is set; if it appears runny and loose, continue baking, if there is a slight wobble within an overall firm texture, the pie is ready.